F L A S H B A C K — You’re standing in a ridiculously long line of fresh-off-of-the-clock human beings. Walmart has one check-out lane open, and you just want to get home where Netflix and Velveeta instant mac-n-cheese are calling your name. But no! You and everyone else will have to bare a bit longer, all because that last item in your cart will not scan. F L A S H F O R W A R D — you are now a successful business owner, and you have a new product that is ready to go to market (Congratulations)! You want to take extra care to make sure that your product is never responsible for holding up a line. Here are some tips for creating a barcode that will scan properly every time! UPC-A barcodes are typically used on retail products, so in order to sell your item in a store or online, you will likely need one. These specific barcodes consist of 12 numbers. The first few digits are your “company prefix,” which is uniquely assigned to identify that the product belongs to your company. That prefix remains consistent across all of your company’s barcodes. The last set of digits are the “product code,” which are always different to identify individual products. There are many websites where you can purchase your unique UPC codes, so feel free to shop around. Upon purchase, these sites will often include PDF files of the barcodes for you to pass on to your graphic designer. PRO TIP: One well-known, reputable site that we always recommend for purchasing barcodes is GS1. Technology is always improving! However, the stores selling your products do not update their scanners each year. Most likely, these stores have standard or older models. Some might have handheld scanning guns, while others may have their scanners embedded in-counter. To ensure scannability across all forms new and old, the smallest size that we suggest for a barcode is 1.469” wide x 1.02” tall. PRO TIP: Scanners are reading the spaces between the bars — so if you absolutely need to go smaller in size, it is better to make your barcode wider instead of taller. The last thing you want is a blurry barcode where the bars and spaces are so pixelated that they bleed into one another. Let your graphic artist know that a vector barcode is the best way to go! Or if you are not using a vector file, be sure that the resolution of the barcode is 300 dpi or higher. The key here is contrast! Most scanners are designed to read DARK BARS on a LIGHT background. There must be enough contrast between the dark bars and the light background for the scanner to differentiate between them. This is why the traditional black bars on a white background is the most ideal combination. But maybe you’re a revolutionary! You’re a Picasso of barcodes. We salute you! 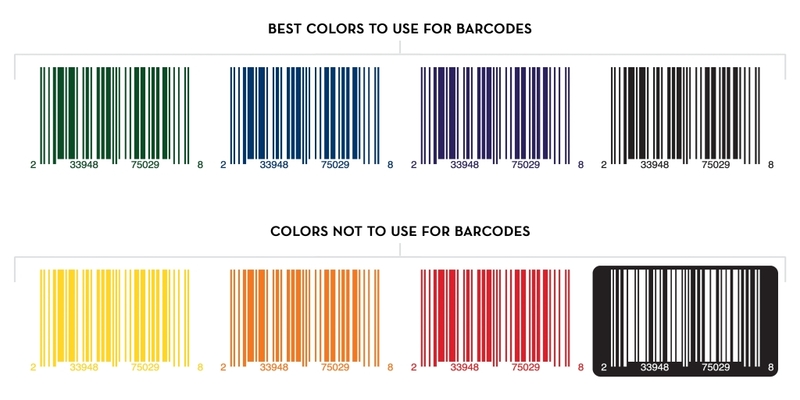 Just remember that scanners typically use red light to illuminate the barcode, so warm colors like yellow, red, orange, and white are NOT good colors for your bars because those colors will reflect the red light. PRO TIP: Cooler colors like blue, green, purple, and black are better choices for your bars because they appear black under the light. With the technology that we have at our fingertips today, this has never been easier! Go ahead and print off your proof at 100% / NO SCALE so that your label prints to size. You can download a barcode scanner on your smartphone and test it out! In a matter of minutes, you can feel secure in knowing that your barcode passes the test. If you have any questions about your barcodes, reach out to our friendly Experience Team at 877-277-4682 or shoot us an email at customerservice@frontierlabel.com. We would love to help you find some answers and get your products scanner-ready. Happy printing!